This avocado salad recipe is one of my favorites. 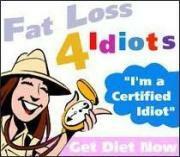 Trust me it so delicious - you will beg for more! Also it is very easy to make (it takes only 15 min), is satisfying and very nutritious: one serving provides 28% of your Daily Value (DV) of vitamin A, 26% of vitamin B-6, 40% of vitamin C, 30% of folate, 20% of manganese, 25 of niacin, 20% of phosphorus, 46% of thiamin, 24% of potassium and 28% of fiber. There are 248 calories and 5g of net carbs per serving. Diabetes Appropriate, Healthy Weight, High Fiber, High Potassium, High Protein, Low Calories, Low Carbs, Low Cholesterol, Low GI, Dairy Free, Good source of Vitamin A, Vitamin B-6, Vitamin C, Folate, Manganese, Niacin, Phosphorus and Thiamin. 8 tbsp. of vegetable stock. In each salad bowl arrange the lettuce with avocado and put to one side. For the dressing: in a cup mix all the salad dressing ingredients together and put to one side. 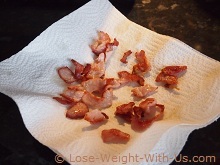 Separate the fat from the bacon rashers, but don't throw it away. Then cut the meat into 2.5cm (1") pieces. 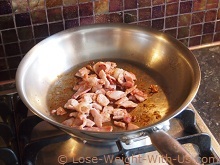 Preheat a large frying pan and throw the fat from the bacon onto the frying pan, let it sizzle for a few minutes, stirring occasionally. 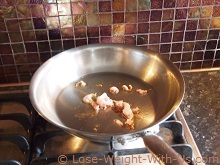 In about 3-5 min, when we have enough fat on the frying pan for cooking, add the bacon meat and fry, moving it around until it starts going crispy. Take the frying pan off the heat, throw away the fat we used for the cooking, transfer the bacon onto a paper towel and pat the bacon, removing all of the fat. 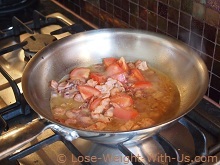 With a paper towel wipe the fat from the frying pan, put it on the heat again, throw in the bacon with the tomatoes and salad dressing we made above, and let it sizzle to warm through for about 30 seconds. 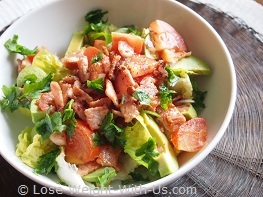 With a slotted spoon, distribute th bacon and tomatoes on the top of the lettuce and avocado in each salad bowl, pour the dressing over the salad, sprinkle with the parsley leaves and black pepper. Serve immediately before it gets cold.